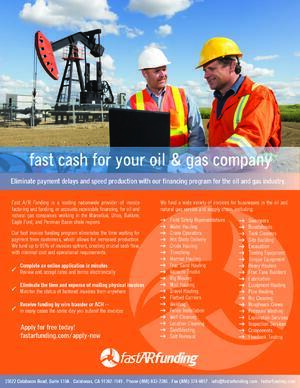 Fast A/R Funding is a leading nationwide provider of invoice factoring, or accounts receivable financing, for oil and gas companies working in the Marcellus, Utica, Bakken, Eagle Ford, and Permian Basin shale regions. Oil and gas businesses enjoy our seamless online system of submitting and tracking invoices for funding. We fund up to 95% of invoices upfront, creating crucial cash flow, with minimal operational requirements.